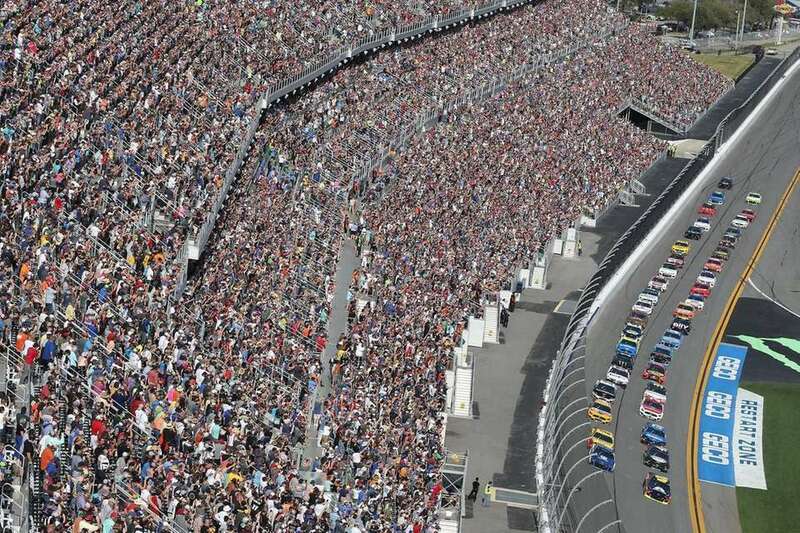 Scenes from he Monster Energy NASCAR Cup Series 61st Annual Daytona 500 at Daytona International Speedway on Feb. 17, 2019 in Daytona Beach, Florida. 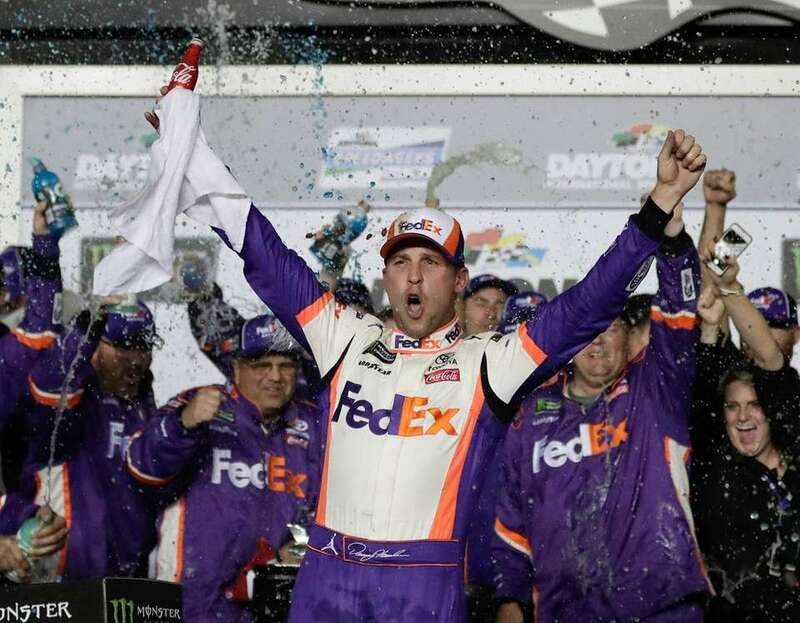 Denny celebrates after winning the Monster Energy NASCAR Cup Series 61st Annual Daytona 500 at Daytona International Speedway on Feb. 17, 2019 in Daytona Beach, Florida. 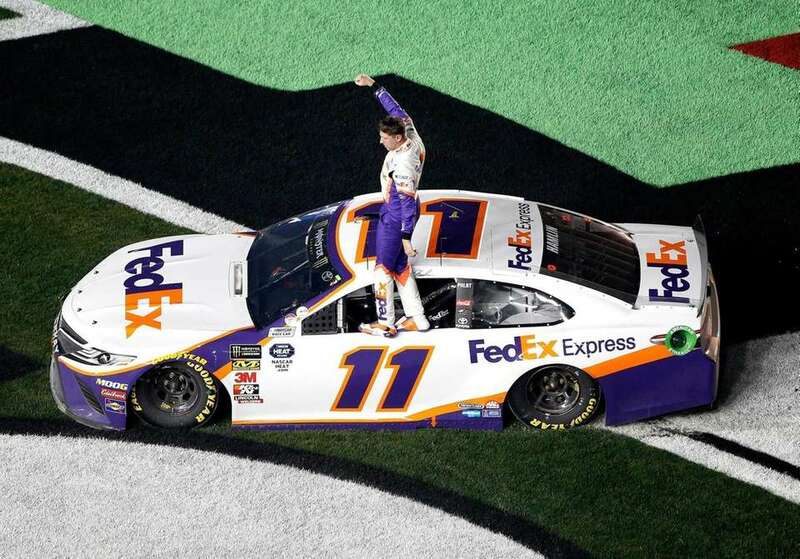 Denny Hamlin, driver of the #11 FedEx Express Toyota, celebrates winning the Monster Energy NASCAR Cup Series 61st Annual Daytona 500 at Daytona International Speedway on Feb. 17, 2019 in Daytona Beach, Florida. 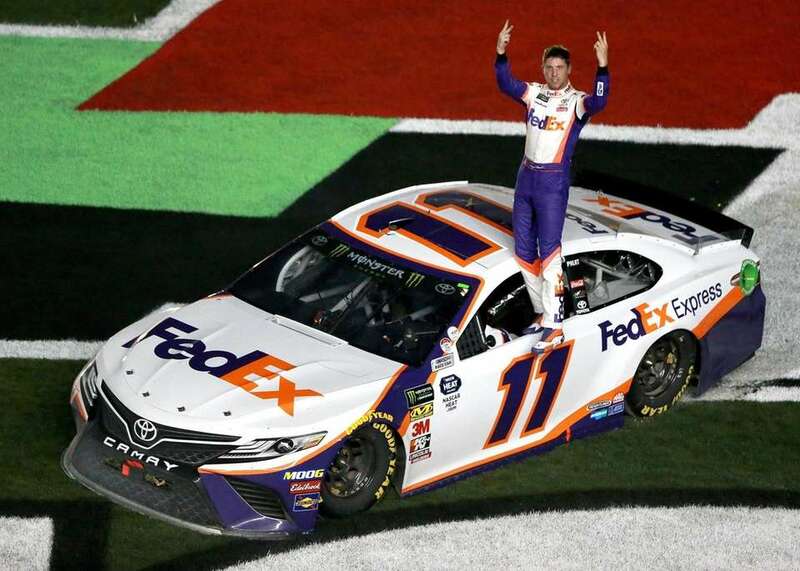 Denny Hamlin celebrates in Victory Lane after winning the Monster Energy NASCAR Cup Series 61st Annual Daytona 500 at Daytona International Speedway on Feb. 17, 2019 in Daytona Beach, Florida. 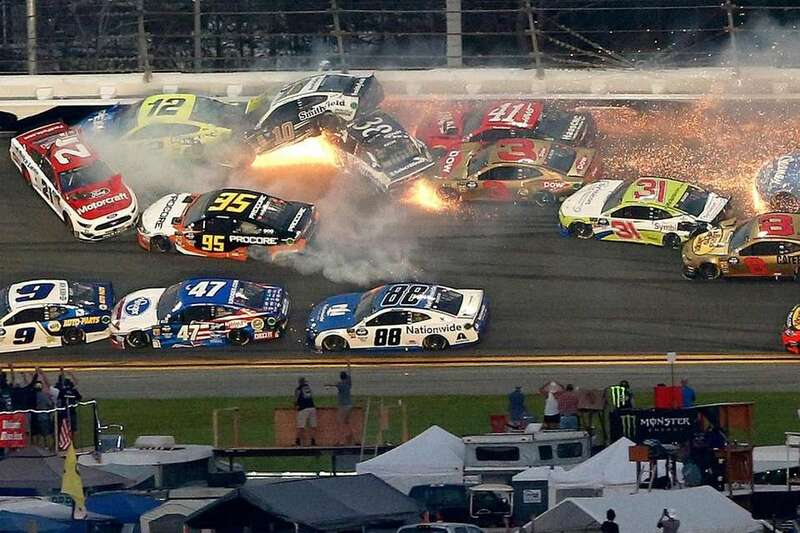 Several car crash during the Monster Energy NASCAR Cup Series 61st Annual Daytona 500 at Daytona International Speedway on Feb. 17, 2019 in Daytona Beach, Florida. 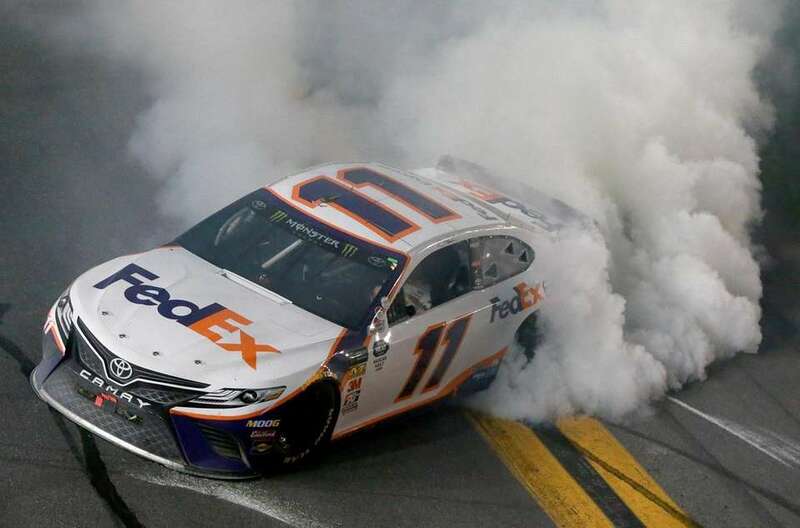 Denny Hamlin performs a burnout after winning the Monster Energy NASCAR Cup Series 61st Annual Daytona 500 at Daytona International Speedway on Feb. 17, 2019 in Daytona Beach, Florida. 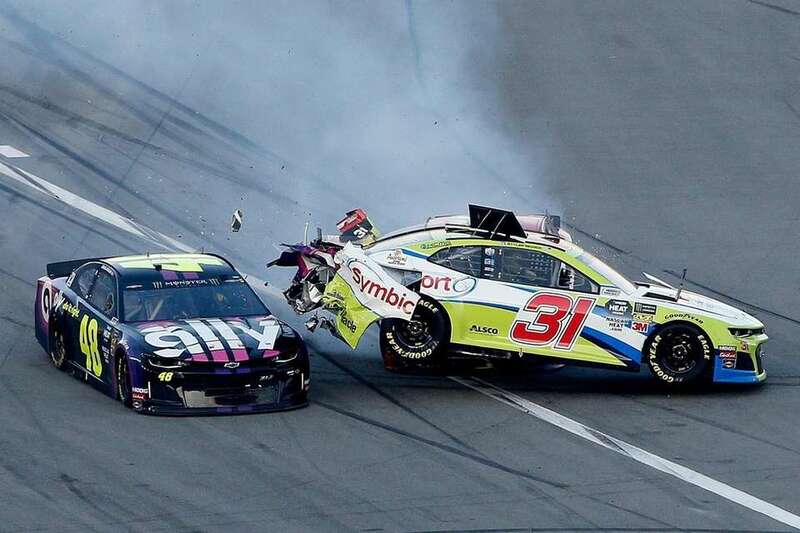 Tyler Reddick, driver of the #31 Symbicort Chevrolet, and Jimmie Johnson, driver of the #48 Ally Chevrolet, are involved in an on-track incident during the Monster Energy NASCAR Cup Series 61st Annual Daytona 500 at Daytona International Speedway on Feb. 17, 2019 in Daytona Beach, Florida. 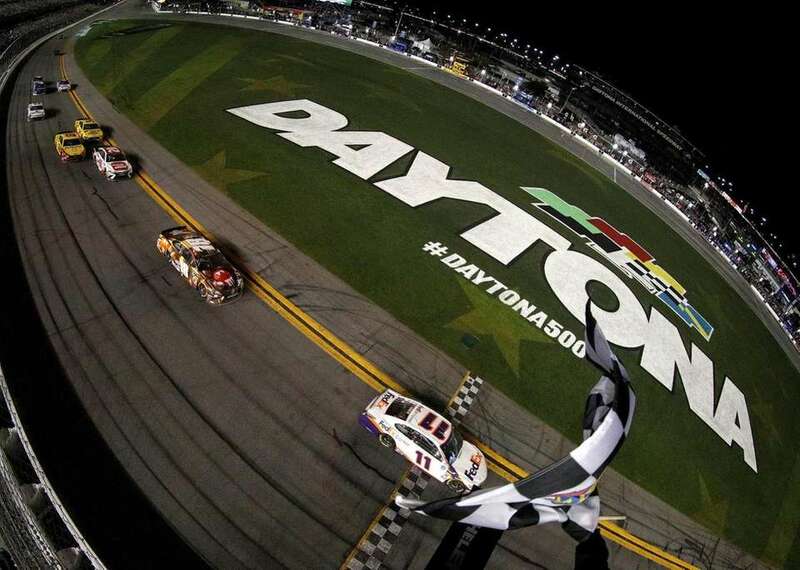 Denny Hamlin, driver of the #11 FedEx Express Toyota, crosses the finish line winning the Monster Energy NASCAR Cup Series 61st Annual Daytona 500 at Daytona International Speedway on Feb. 17, 2019 in Daytona Beach, Florida. 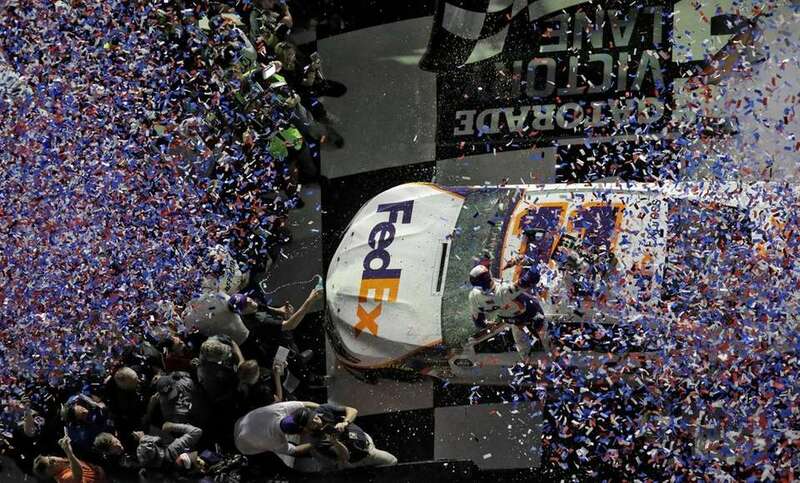 Denny Hamlin is showered with confetti in Victory Lane after winning the Monster Energy NASCAR Cup Series 61st Annual Daytona 500 at Daytona International Speedway on Feb. 17, 2019 in Daytona Beach, Florida. 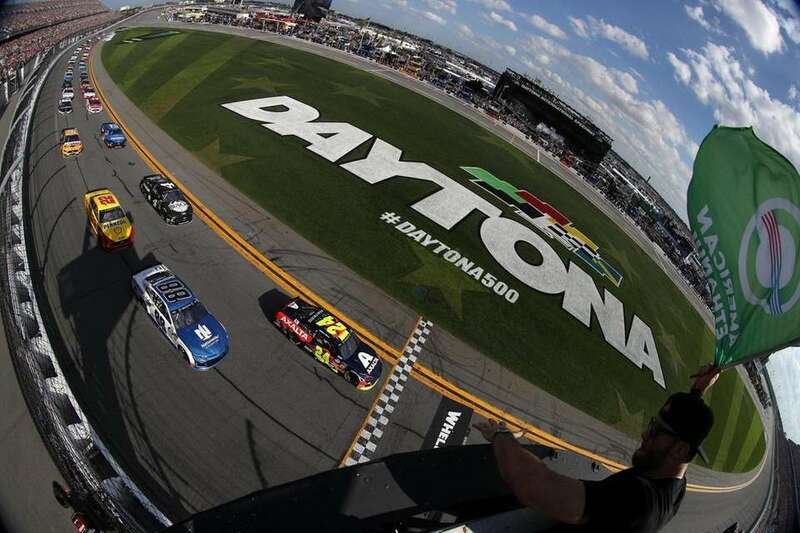 William Byron, driver of the #24 Axalta Chevrolet, and Alex Bowman, driver of the #88 Nationwide Chevrolet, lead the field during the Monster Energy NASCAR Cup Series 61st Annual Daytona 500 at Daytona International Speedway on Feb. 17, 2019 in Daytona Beach, Florida. 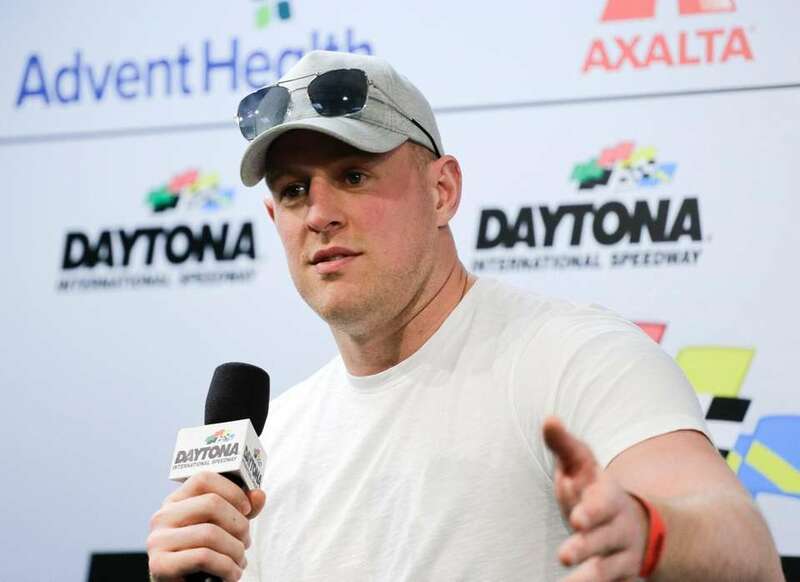 Daytona 500 grand marshal and Houston Texans defensive end J.J. Watt answers questions during a news conference at the Monster Energy NASCAR Cup Series 61st Annual Daytona 500 at Daytona International Speedway on Feb. 17, 2019 in Daytona Beach, Florida. 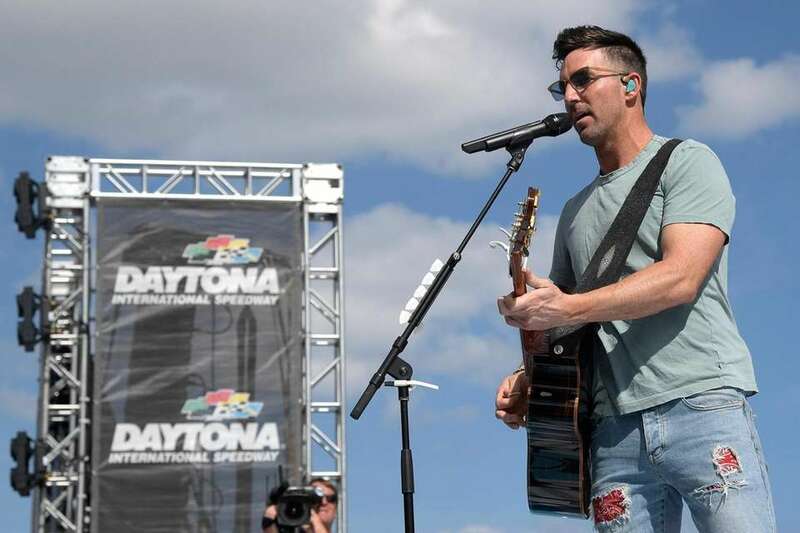 Entertainer Jake Owen performs before the Monster Energy NASCAR Cup Series 61st Annual Daytona 500 at Daytona International Speedway on Feb. 17, 2019 in Daytona Beach, Florida. 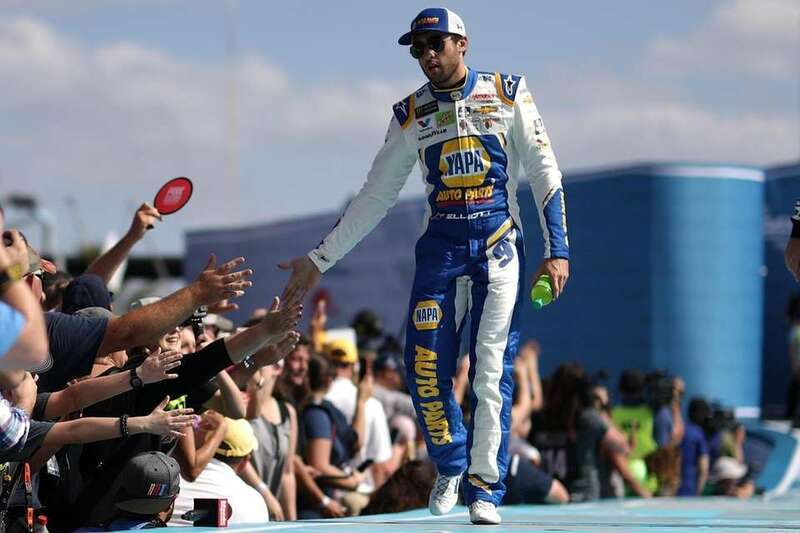 Chase Elliott, driver of the #9 NAPA Auto Parts Chevrolet, is introduced during the Monster Energy NASCAR Cup Series 61st Annual Daytona 500 at Daytona International Speedway on Feb. 17, 2019 in Daytona Beach, Florida. 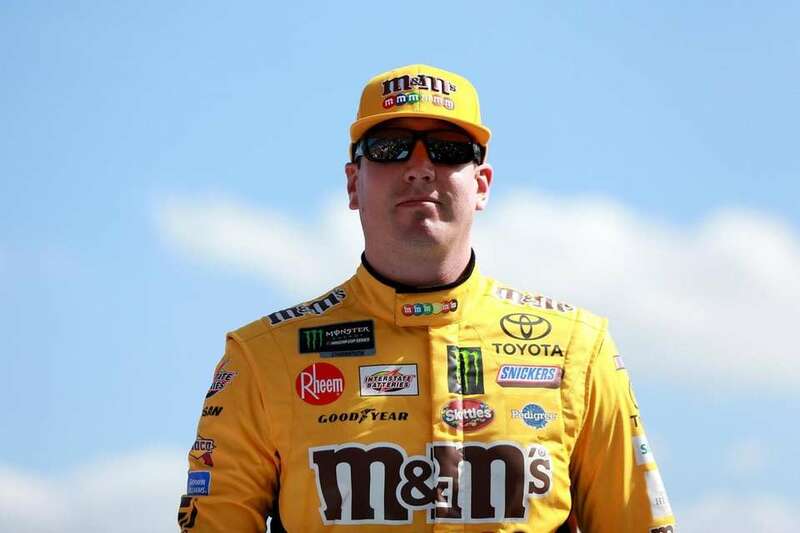 Kyle Busch, driver of the #18 M&M's Chocolate Bar Toyota, is introduced before the Monster Energy NASCAR Cup Series 61st Annual Daytona 500 at Daytona International Speedway on Feb. 17, 2019 in Daytona Beach, Florida. 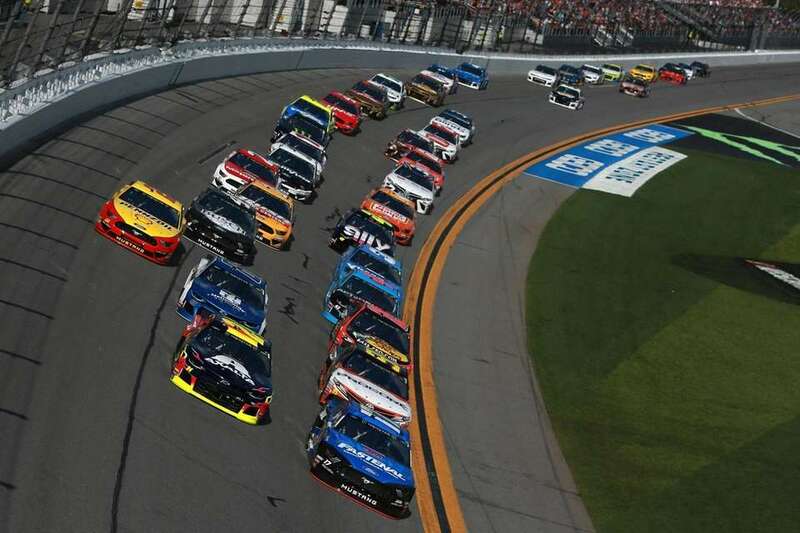 Matt DiBenedetto, driver of the #95 Procore Toyota, leads the field during the Monster Energy NASCAR Cup Series 61st Annual Daytona 500 at Daytona International Speedway on Feb. 17, 2019 in Daytona Beach, Florida. 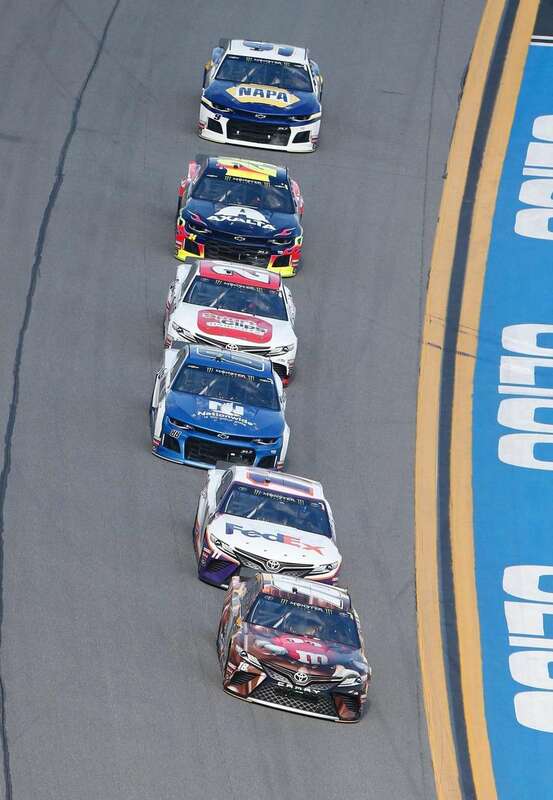 William Byron, driver of the #24 Axalta Chevrolet, leads a pack of cars during the Monster Energy NASCAR Cup Series 61st Annual Daytona 500 at Daytona International Speedway on Feb. 17, 2019 in Daytona Beach, Florida. 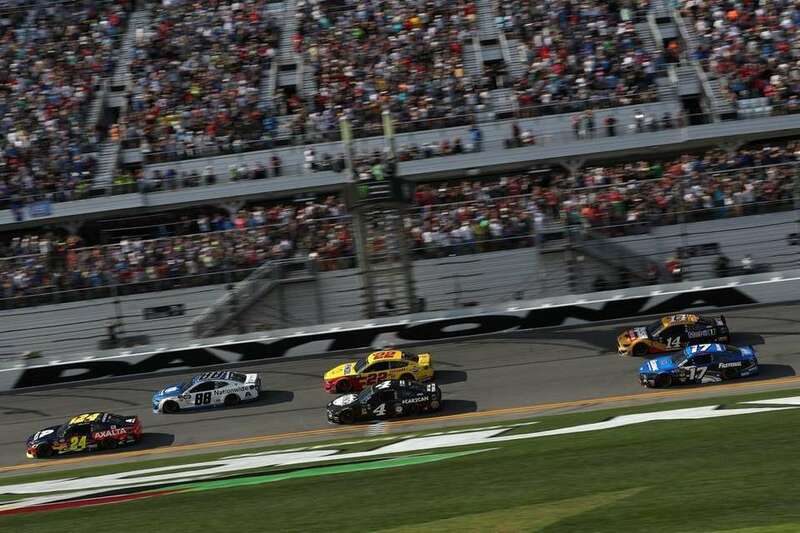 Kyle Busch, driver of the #18 M&M's Chocolate Bar Toyota, leads a pack of cars during the Monster Energy NASCAR Cup Series 61st Annual Daytona 500 at Daytona International Speedway on Feb. 17, 2019 in Daytona Beach, Florida. 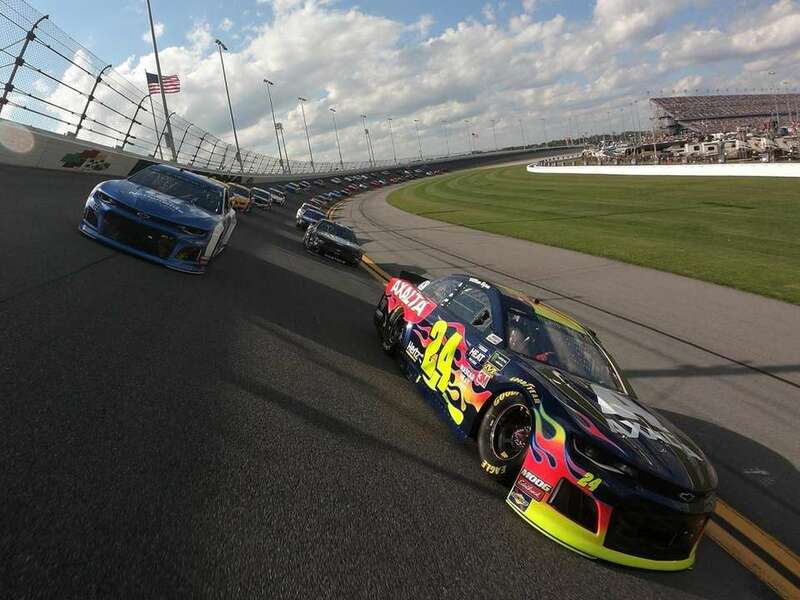 William Byron, driver of the #24 Axalta Chevrolet, and Alex Bowman, driver of the #88 Nationwide Chevrolet, lead the field during pace laps prior to the start of the Monster Energy NASCAR Cup Series 61st Annual Daytona 500 at Daytona International Speedway on Feb. 17, 2019 in Daytona Beach, Florida. 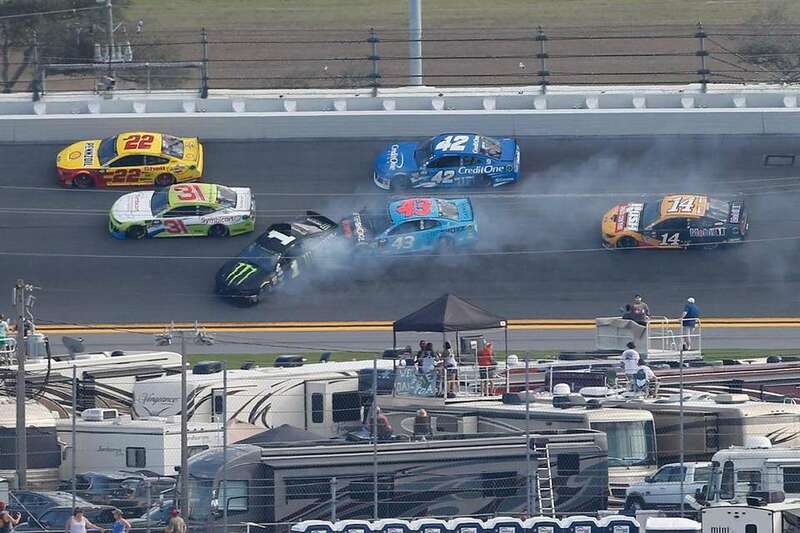 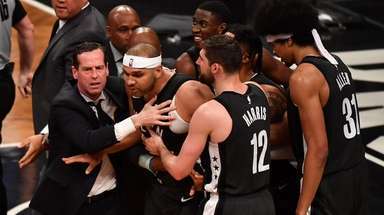 Kurt Busch, driver of the #1 Monster Energy Chevrolet, and Bubba Wallace, driver of the #43 Aftershokz Chevrolet, are involved in an on track incident during the Monster Energy NASCAR Cup Series 61st Annual Daytona 500 at Daytona International Speedway on Feb. 17, 2019 in Daytona Beach, Florida. 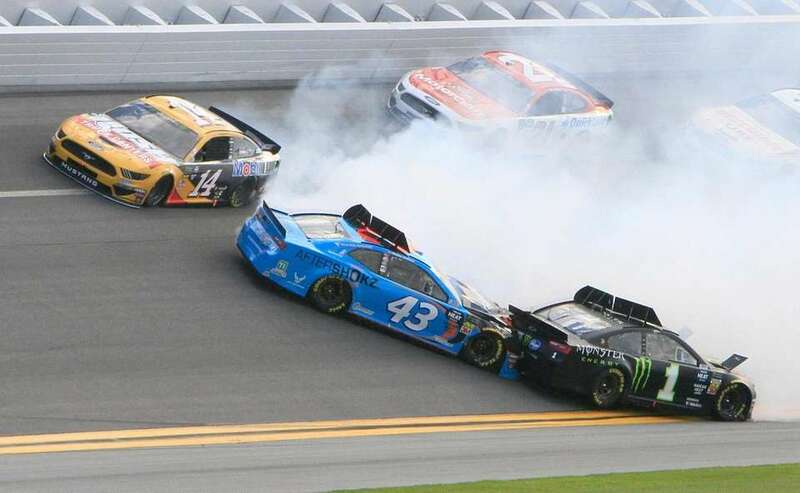 Darrell Wallace Jr. (43) gets caught up in a wreck with Kurt Busch (1) as Clint Bowyer (14) goes high to avoid the crash during the Monster Energy NASCAR Cup Series 61st Annual Daytona 500 at Daytona International Speedway on Feb. 17, 2019 in Daytona Beach, Florida. 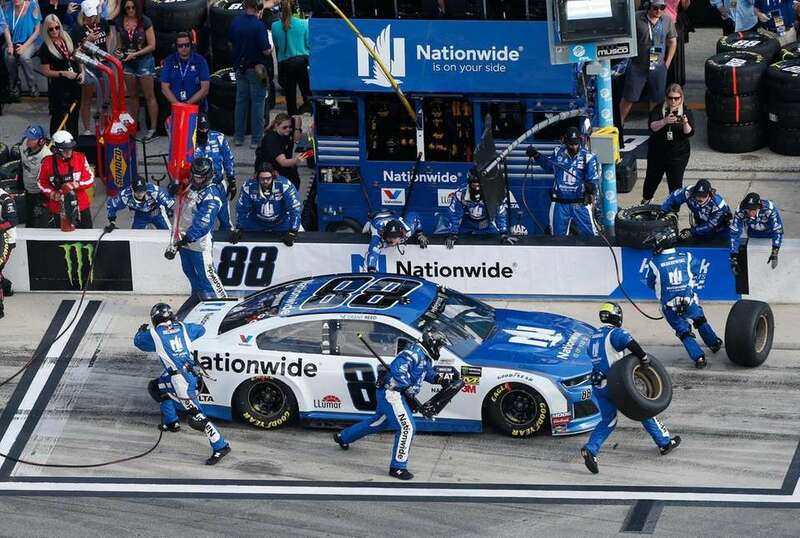 Alex Bowman, driver of the #88 Nationwide Chevrolet, pits during the Monster Energy NASCAR Cup Series 61st Annual Daytona 500 at Daytona International Speedway on Feb. 17, 2019 in Daytona Beach, Florida. 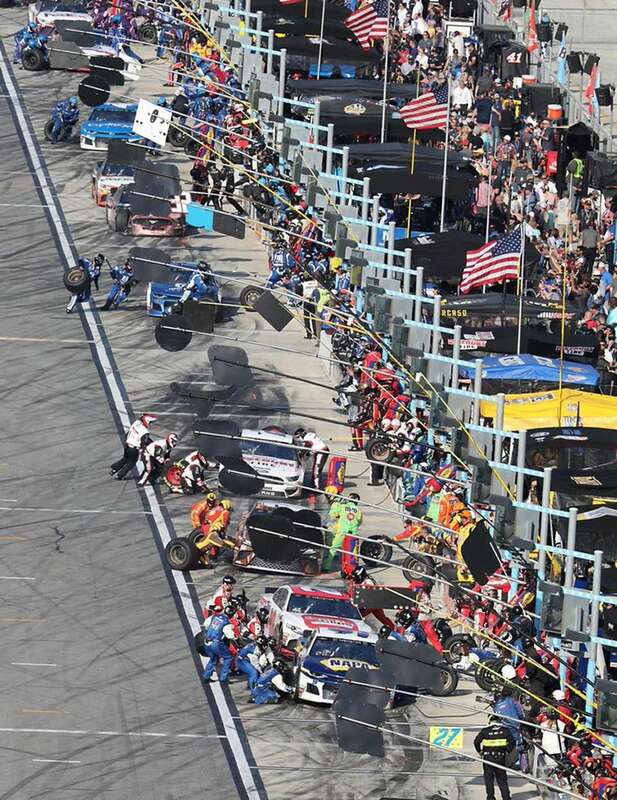 Cars pull in the pits for tires and fuel during the Monster Energy NASCAR Cup Series 61st Annual Daytona 500 at Daytona International Speedway on Feb. 17, 2019 in Daytona Beach, Florida. 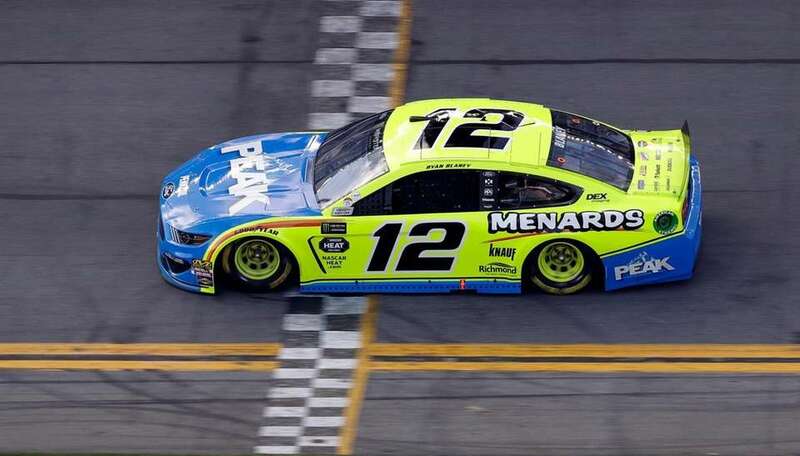 Ryan Blaney (12) crosses the finish line to win the second stage during the Monster Energy NASCAR Cup Series 61st Annual Daytona 500 at Daytona International Speedway on Feb. 17, 2019 in Daytona Beach, Florida.